The mammographic mass is a space-occupying lesion seen in two different projections. Mam-mographic analysis of the mass is based on its shape, margins, and density. Round or oval shaped masses are typically associated with a benign etiology, most commonly a cyst or fibroadenoma. Increasing lobulations, irregular shapes, and spiculations increase the probability of malignancy. Assessment of the lesion margin adds important distinguishing information. Circumscribed lesions with sharp, distinct margins are almost always benign (Figure 3-1). Poorly defined margins reflect the irregular interface of the cancer cells invading the surrounding breast tissue. Due to superimposed normal fibroglandular tissue, lesion margins can occasionally be obscured and difficult to accurately assess. 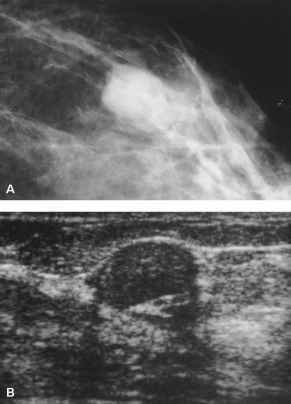 Spot compression views and ultrasonography allow for further characterization of lesion margins, particularly in dense breast tissue. Figure 3-1. A, Mammographic image reveals the circumscribed and gently lobulated margins of this fibroadenoma. 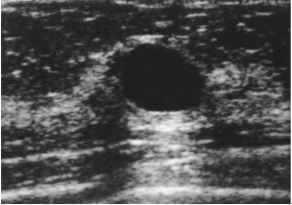 B, Corresponding ultrasound shows the solid nature of this benign tumor as evidenced by the homogenous hypoechoic internal architecture. Figure 3-2. Sonographic depiction of a simple cyst. Note the lack of internal echoes and increased echogenicity deep to the fluid (posterior acoustic enhancement). Most breast cancers are mammographically dense (more radio-opaque) relative to an equal volume of normal fibroglandular tissue. The presence of radiolucent fat within a lesion is characteristic of a benign etiology. Fat containing lesions include hamartoma (fibroadeno-lipoma), lipoma, galactocele, fat necrosis, and lymph nodes.